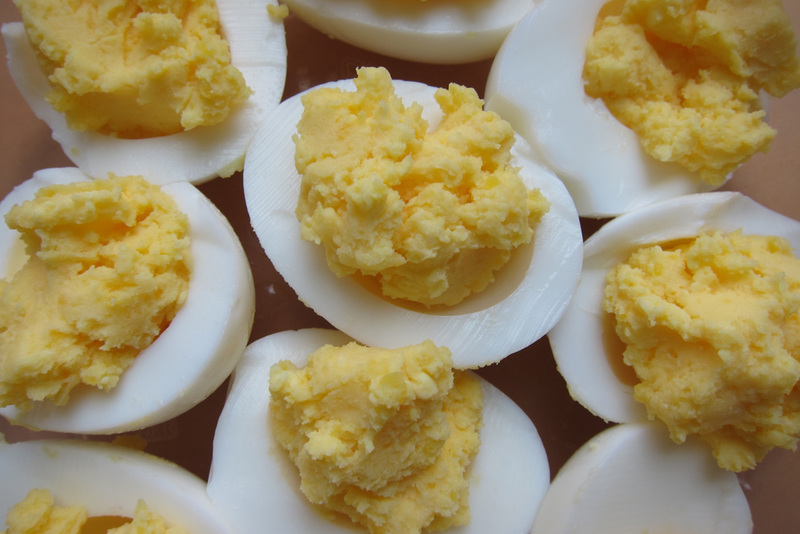 A perfectly hard-boiled egg is a thing of beauty. One that makes me reflect on the great tenderness with which God strews visual delights everywhere. Getting a perfect hard-boiled egg is another matter all together. But whether it comes out perfectly or no, transforming ordinary eggs into angel eggs makes them a fantastic treat. And a quick food at that. So first, let me share some of the best secrets for perfect hard-boiling. I was blessed to learn how to make them growing up, though I no longer put the eggs in cold water, but put them directly into the water boiling. This is a multi-step process, but it really doesn't take that long. Oh, and a timer is your friend. First - get some older eggs. The ones from your farmer are often fresher than what is carried at the grocery store - so let them sit for a while. 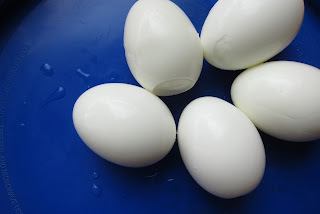 Newer eggs will still work, but the white will stick to the shell more and they won't be so pretty. Fill a pot with enough water to cover your eggs. Your best estimate is ok. If you didn't quite have enough water, you can add more. Turn the heat on medium-high. This is the trick I learned growing up: use a knife to gently tap the eggs and just barely crack them. To do this, hold the egg in one hand, and (carefully!) the blade of a knife in the other. Then let the handle of the knife tap the egg gently until you just hear it crack. This lets the egg release air while cooking and not stick to the shell. 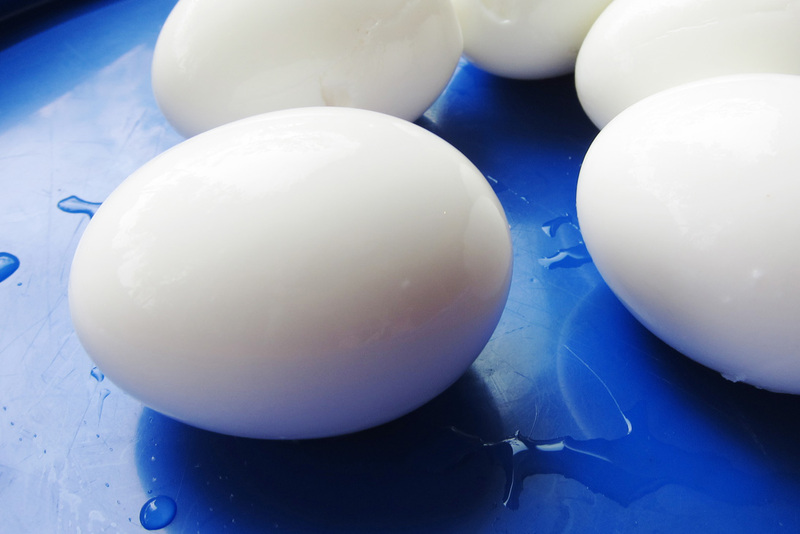 After all the eggs are just barely cracked, your water should be ready. Once the water is simmering, add your eggs with a ladle or spoon. Continue to let the water simmer - but not boil - until the eggs are done. For my medium eggs (though comparatively, grocery store size large) 10 minutes came out perfectly. Do slightly less time for smaller eggs, more for larger. Cooking mixed sizes will still be ok - though you may have yolks that are drier if overcooked. Once the timer beeps - hurry! Turn off the heat, and gently pour off the hot water. Immediately put cold water in the pot, and dump in a full tray of ice cubes - being careful not to crack the eggs as the ice falls in though! Swish them around a little bit to stir in the ice. The eggs should sit in the ice water for a while until they are completely cool. I usually figure 10 minutes, though often I get busy and it is much longer. To peel, gently tap the egg all over on the counter, rolling it until the whole surface is cracked. This link gives a great demonstration. Using the side of your thumb helps to not dent the surface. For a different method (and this was my standard for a long time) Check out It's Fitting blog. Everyone's stoves and subtle differences require a little bit of tweaking to get consistent results. 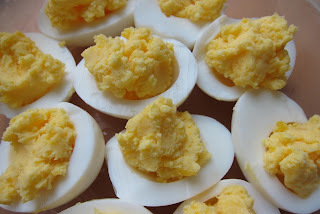 To make angel eggs - add about equal amounts butter as there is yolk, and mash it all together. It may need more butter to get to the right consistency. A sprinkle of salt is good too. You did pull out the butter to soften before you started all this right? And who says that the egg yolk filling has to be piped? 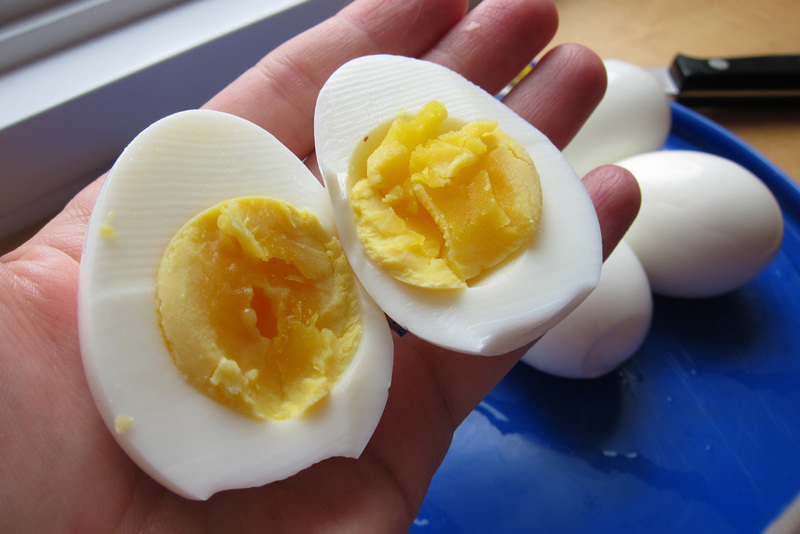 Personally, I enjoy the contrast of the shiny smooth egg white and the rough chunks of egg yolk filling. Besides, these never last long enough to be eye candy. This has become a favorite GAPS convenience food now - high protein, high fat, wonderfully delicious and beautiful to boot.